Finally it's out, here's what we will expect on February 18, 2018 at the Staples Center in Los Angeles. So its Team Lebron versus Team Curry. It will be an exciting game to watch. Its a pick up game where the team captains chose among the pool of 24 players the media, the fans and players voted for. So expect its a great mix up of players. What a match up Lebron against Curry, that alone is worth it, have them pick up their team players, that is surreal. We do hope next time, they will televise when they choose their players. 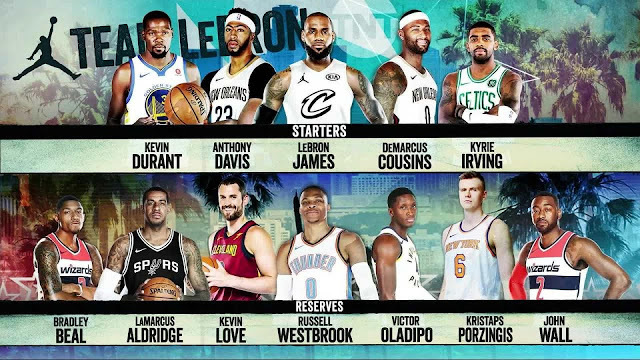 Now the team to watch is Team Lebron. Here we would like to watch how Kyrie Irving would play with Lebron. Imagine another play, having to see Russel Westbrook passing off to Kevin Durant. These are the playing dramas we would like to at the All Star Games this month. Another play without the drama is Lebron playing with Kevin Durant. These two have much respect to each other so its a play we would like to see as well. Here's the roster for his team. Of course, he leads his team as Guard. Joining him as starters will be Kevin Durant, Anthony Davis, DeMarcus Cousins (Replaced by Paul George) and Kyrie Irving. Reserves are Bradley Beal, laMarcus Aldridge, Kevin Love, Russel Westbrook, Victor Oladipo, Kristaps Porzingis and John Wall. What an awesome line up if you ask us. Team Curry watch out for this explosive team. And also, If you want drama, then his team is it. 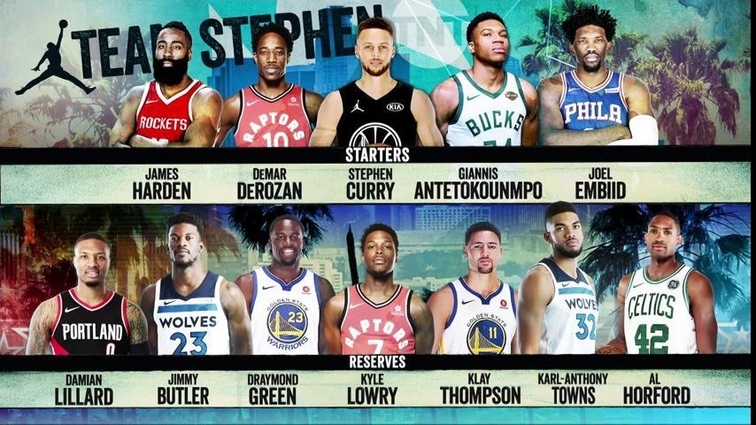 Now Stephen Curry leads his team as a starter along with these explosive players, James Harden, DeMar DeRozan, the Greek Freak Giannis Antetkokounmpo and Joel Imbiid. What an impressive line up, enough said. Joining them as reserves are Damian Lillard, Jimmy Butler, Draymond Green, Kyle Lowry, Klay Thompson, Karl-Anthony Towns, and Al Horford. This team may not have the same drama with the other team, but this team is no push over. As Curry said, the other team may be crazy, but they have their strategy mapped out already. See you all guys on February 18 in Los Angeles.